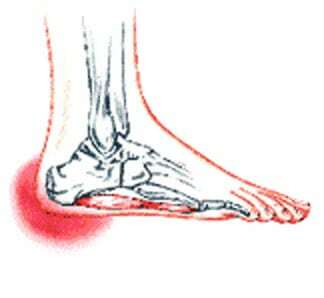 Pain in the bottom of the heel is the most common symptom. The pain is often described as a knife-like, pinpoint pain that is worse in the morning and generally improves throughout the day. By the end of the day the pain may be replaced by a dull ache that improves with rest. The pain results from stretching the damaged tissues. For the same reason atheletes’ pain occurs during beginning stages of exercise and is relieved over time as warm-up loosens the fascia. Plantar fasciitis onset is usually gradual, only flaring up during exercise. If pain is ignored, it can eventually interfere with walking and overall, plantar fasciitis accounts for about ten percent of all running injuries. Clinical trials are underway investigating the use of radiofrequency to treat plantar fasciitis. It is a simple, noninvasive form of treatment. It allows for rapid recovery and pain relief within seven to 10 days. The radio waves promote angiogenesis (formation of new blood vessels) in the area. Once again, increasing blood flow to the damaged tissue encourages a healing response. Antiinflammatory medications are sometimes used to decrease the inflammation in the fascia and reduce your pain. Studies show that just as many people get better with antiinflammatories as those who don’t have any improvement. Since these medications are rarely used alone, it’s difficult to judge their true effectiveness. A cortisone injection into the area of the fascia may be used but has not been proven effective. Studies show better results when ultrasound is used to improve the accuracy of needle placement. Cortisone should be used sparingly since it may cause rupture of the plantar fascia and fat pad degeneration and atrophy, making the problem worse. Botulinum toxin A otherwise known as BOTOX has been used to treat plantar fasciitis. The chemical is injected into the area and causes paralysis of the muscles. BOTOX has direct analgesic (pain relieving) and antiinflammatory effects. In studies so far, there haven’t been any side effects of this treatment.